I have been to hundreds of movie screenings over my decade-long career as a film critic for Redbox, and while my favorite movies certainly stand out in my memory, the screenings themselves usually do not. They are typically hosted in one of three main theaters here in Chicago — either during the day at a smaller screening room that’s solely for critics, or in the evening at a larger theater where a few rows are reserved for critics, but all other seats are open to members of the public who have won advanced passes. These events all blend together as the weeks and months pass. However, the February 2014 screening for The Lego Movie is a screening I remember clearly. It was a critics-only showing during the day, and I don’t think I’m overstepping to say that all of us had low expectations. Why? Because — not always, but usually — films released in the early months are… um… not great. And also because the vast majority of kids’ movies are typically… well… also not so great. So I remember The Lego Movie screening because of how stunned, almost dazed, we all were walking out if it. What was this? An EXCELLENT kids’ movie released in February? Wonders never cease! Miracles can happen! Anything is possible! EVERYTHING IS AWESOME! Now here we are again, nearly 5 years to the day after the original film came out, and I’m happy to say that though my expectations were significantly higher this time around, they were easily met. 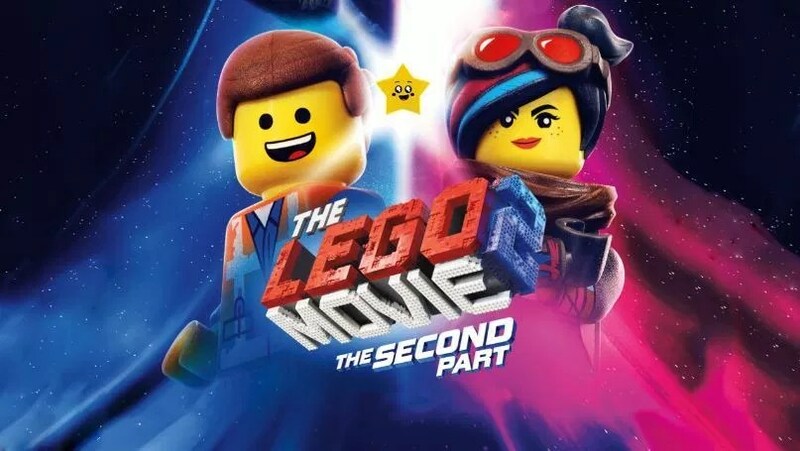 The Lego Movie 2: The Second Part, picks up right where the first installment left off, after we learned that the characters we’d been watching for nearly two hours were being controlled in the real world by an 8-year-old boy named Finn (Jadon Sand). Finn’s younger sister Bianca (Brooklynn Prince) had just invaded his space with her Duplo creations, who threatened to destroy Bricksburg and all of its inhabitants. And destroy it they did. In the new film, we see how the Legos and the Duplos have battled with each other for five years straight, obliterating Bricksburg and hardening its citizens into gritty survivors of what is now known as Apocalypseburg. Except for Emmet (Chris Pratt), who is still as happy, positive and naïve as ever. Until the day his closest friends — Lucy (Elizabeth Banks), Batman (Will Arnett), Unikitty (Alison Brie), MetalBeard the pirate (Nick Offerman) and astronaut Benny (Charlie Day) — are kidnapped by General Sweet Mayhem (Stephanie Beatriz) and taken to the Systar (get it? Sister!) System. Emmet needs to find a way to rescue them, before a frightening vision he’s had of the future comes to pass. Helping Emmet in his quest is Rex Dangervest, also voiced by Pratt, who is not only a “broodier” and more cynical version of Emmet, but also a composite of several characters Chris Pratt himself has played, from raptor wrangler in the Jurassic World series (the subtitled dialogue of the raptors was one of my favorite parts), to cocky spaceman in the Guardians of the Galaxy franchise. Together, Emmet and Rex blast off after General Mayhem, who is bringing her captives to Queen Watevra Wa’Nabi (Tiffany Haddish in a standout voice performance), the Systar System’s constantly-morphing and musically talented leader, who assures everyone that she is most certainly not evil. Like most sequels, The Lego Movie 2 cannot completely recreate the magic of its predecessor, which is not surprising. You can only experience pure amazement at seeing Legos come to life in such a creative way on the big screen once. But the sequel is just as stuffed with pop-culture jokes (many of which will be waaaay over kids’ heads), meta Batman references, tongue-in-cheek one-liners and memorable songs as returning writers Phil Lord and Christopher Miller were able to pack into the first film. Director Mike Miller made one major change in that he often switched back and forth between the Lego/Duplo worlds and the real world throughout the film as a reminder of what was transpiring between Finn and Bianca as the action progressed, but it worked — for this mother of often-squabbling siblings, at least. Just when I thought I was going to get through the movie without tearing up, the final scenes went right for my heartstrings. Without spoiling anything, I will say that I strongly approve of this film’s two main messages: being yourself, and working together. Be sure you stay all the way through the end credits song, which is about … end credits, and is brilliant. Everything is awesome, once again.